GET REGISTERED NOW! TIME IS RUNNING OUT! WHEN: Friday, January 18th at 12 to 1 pm EST. CE: This webinar is 1 Pharmacy CE. Please note: This webinar will NOT be recorded (or available for self-study afterward). REGISTER NOW to reserve your spot! Description: Previously seen as a scourge to human populations, the members of the Helminth family are now receiving increased attention as therapeutic agents. Necator Americanus, or the human hookworm, has been on the receiving end of much of the attention. As a relatively non-communicable organism, with low risk of organ invasion or colonization outside of the small intestine, some formal research and scholarly conjecture as to the therapeutic effects achieved by hookworms have recently been undertaken. This presentation will review current research, mechanisms, and current and potential therapeutics. Current conventional and naturopathic pharmacy will include a reassessment of therapeutic goals. 1. Understand the mechanism of hookworm infection. 2. Review the current worldwide state of autoimmunity in relation to hookworm infection. 3. Understand the genetic mechanism of hookworm side effects and therapeutic effects. 4. Have a contextual grasp for when a patient would receive a therapeutic benefit from hookworms. 5. Know the current state of hookworm research for autoimmune disease. Dr. Nenninger hosts an annual, local talk for patients, NDs, and those interested in his work. His talk is standing-room only and has a long wait list in advance of his presentation. Dr. Steve Nenninger is a naturopathic doctor that graduated in 1995 from the National College of Naturopathic Medicine. His interest in naturopathic medicine manifested from his personal experience with Crohns and colitis after being vaccinated in the Marine Corps. Eventually he found himself at a dead end as conventional medicine had no viable treatment beyond getting a colostomy. 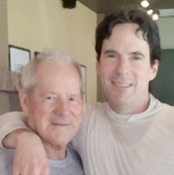 His journey to healing began when he went to visit a naturopathic physician. When that progress plateaued, he began naturopathic medical school to learn how to treat his autoimmune disorder. Throughout his nearly 30 years of practice one question has permeated his thinking; why every one of his siblings suffers from painful autoimmune disease. He found his own case (and those of his siblings) particularly difficult to cure in spite of seeing a compete resolution in similar cases. Over the years Dr. Nenninger has been trying to get a clear understanding of the reasons why auto-immune disease treatments can be effective in some and ineffective in others. Helminth therapy is one type of therapy that has in understanding and helping clients. Non-members $10 (no CE)/$35 (with CE). Members are FREE (no CE)/$25 (with CE).